With over 10,000 SKUs across two divisions and multiple brands, seasonal and home decor manufacturer and distributor The Gerson Companies needed a better way to organize product market data and expand across hundreds of retailers. After investing in product experience management, the company was able to centralize product information in Salsify and empower its network of independent retailer with the data needed to sell successfully online. Build a centralized, flexible, and accessible source of production information to arm all divisions of Gerson with the most up-to-date product inventory. Meet requirements for retailers. 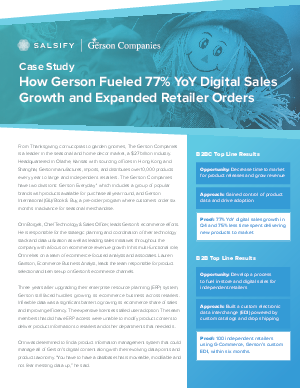 The Gerson Companies uses Salsify to syndicate product information across the digital shelf for their B2C divisions. Drive adoption of data accessibility across organization to empower research and sales team.